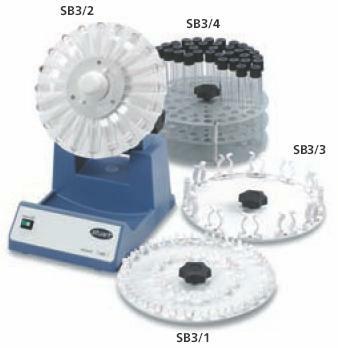 The SB3 is ideal for aerating cultures, keeping biological samples in suspension and for general mixing applications. 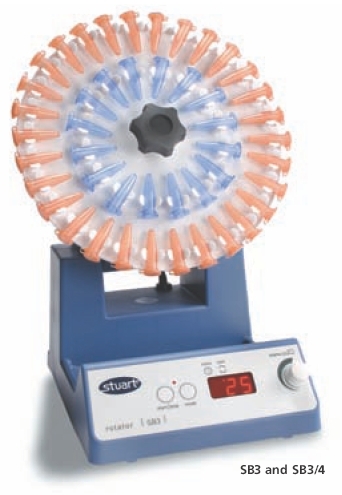 The rotator can be used in incubators up to 60 degC and in cold rooms down to 4 degC. 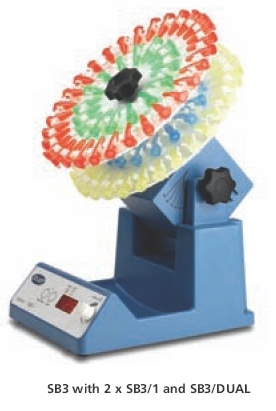 The rotator has a variable speed of 2 to 40rpm for gentle rolling or vigorous mixing of samples and the angle of rotation is fully adjustable, from horizontal for minimal mixing to vertical for full end-over-end mixing. A digital timer and speed display allow procedures to be accurately repeated for optimal results. A tray catches any spillage from the rotating tubes. Scale to measure mixing angle for future reference or continuity. A choice of six tube holders are available to fulfil most applications. It is possible to use two tube holders simultaneously with our dual holder accessory.